"Nothing we do in the Knesset can compare to what the residents do every day simply by living here," stated MK Sharren Haskel. Member of Knesset Sharren Haskel (Likud) has been visiting Hebron on an almost monthly basis, bringing with her a cadre of Likud activists. One of the newest and youngest member of Knesset, Haskel grew up in Kfar Saba, which she describes as a Labor party stronghold. But attending college in Australia gave her a different perspective on Israel and the Middle East. 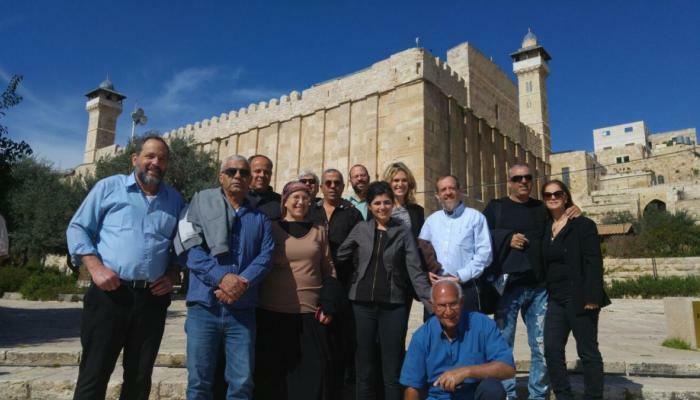 In March, MK Haskel again visited Hebron was guided by local residents such as former MK Orit Struck, CEO of the Jewish Community of Hebron Uri Karzen, and spokesperson Noam Arnon. The tour began at the newly excavated archaeological site in the Tel Hevron / Admot Ishai neighborhood which was conducted in 2014 by the Israel Antiquities Authority and Ariel University. The excavations revealed Jewish life in Hebron dating back to the second Temple period, from which there has been no known prior research. Two impressive and elegant mikvot [ritual baths] were discovered, evidence that the residents believed in maintaining the laws of ritual purity. Facilities next to the ritual baths were discovered for the manufacturing of wine, oil and pottery, which attests to agricultural products being produced on an industrial scale. The proximity of the mikvot next to the wine presses gives reasonable evidence that the wine was sent to the Holy Temple in Jerusalem. Hebron has been known since antiquity for its superior soil and weather conditions for grape harvesting. The archaeological site has not yet been opened to visitors, and the Jewish Community of Hebron expects relevant government agencies to eventually develop the area. A surprise also greeted the tour group as they saw large and impressive olive trees along with flowers in full bloom and lush green spaces. However, along with the natural beauty, the delegation lamented the heaps of garbage that had been dumped in piles by local PA residents. The delegation visited the Jewish history museum at the Beit Hadassah building, Israel's first Hadassah hospital, and watched the new 4D documentary film "Touching Eternity". One of the visitors commented, "we learned that Hebron is completely different than we thought. We walked here safely and peacefully. We saw interesting sights and wonderful people -- a large Jewish community full of content and meaning." MK Haskel emphasized the significance of the Hebron community stating, "when you come here, you become open to a world that many in the country do not know about. Our history began here. These buildings where the Jewish community lives have been here for hundreds of years. Looking at old black-and-white photos is not the same as actually being here." "We who grew up in the Tel Aviv region, Kfar Saba, and other cities, sometimes forget that life here in Israel has an historic link which goes beyond religion. It is a historical and cultural connection which unites us as a people. And to come here and see it, is something special. The fact that we have the ability to see it and feel it, is thanks to the residents who actually live here." "No matter how much we do in the Knesset, it cannot surpass by what do you. You have invested your lives, your families and your livelihoods in this city so that it is more then just a museum, but a real community, so that the rest of us can come visit for just a few hours. You are fighting every day for our history and our heritage. I have a very great appreciation for it."